ABBEYFEALE ON LINE! : HARRY'S GAME! The appointment of three-time major winner Padraig Harrington as Ryder Cup captain for 2020 has met with universal approval. Padraig has served as vice-captain at the last three Ryder Cups and appeared six times as a player. He was on the winning team in 2002, 2004, 2006 and 2010, and brings a wealth of experience to the job. Padraig and I never met, but our golfing careers seemed to have run parallel for a time. While Padraig was out winning majors and world titles all over the place, I was enjoying more modest success in Royal Bogmount, bringing home the occasional hamper or frozen turkey. And during my brief tenure as captain of Abbeyfeale Golf Club an open invitation was extended to Harrington to come and enjoy the hospitality of our club. It was hoped that he might play against the club captain (me) in an exhibition match, and a plaque was even commissioned to present to the winner. Sadly, Harrington was forced to decline our invitation, citing a busy work schedule. However, I suspect that the difficulties associated with playing at Bogmount and my rather generous golf handicap of +20 may have frightened him off! Royal Bogmount was often compared to Augusta. The fairways were narrow and the greens tricky on both courses. The 6th hole in Bogmount was a 580 yard monster. uphill to a postage-stamp sloping green. It was comparable with anything at Augusta National. Perhaps if Harrington had spent a bit of time practising at Royal Bogmount he might have won a Masters. Bogmount was finally forced to close its doors in 2012 and Padraig’s hopes of ever donning the green jacket would now seem to have disappeared as well. We enjoyed good times back in our golfing days, and got to play on such famous courses as Ballybunion, Adare and Killarney, etc. There was a great sense of camaraderie and we never took ourselves too seriously. Our first salutation on arriving at a new course was always to ask “Have ye a bar here at all?” We had our priorities right. We played with various partners down through the years and some proved problematic. I will refrain from naming them here - but you all know who you are! One individual tormented us more than others. He would stand on the first tee and gaze down the fairway as if seeking some divine inspiration. Finding none, he would then bend down and pluck a blade of grass and throw it in the air to test the direction of the wind. Having ascertained that there was no wind to worry about, he began rummaging around in his bag to find a suitable club. After several minutes he would abandon the search and consult the yardage on his scorecard. Finally he would grab a club and unleash a mighty swipe down the fairway and in to deep rough. “Nice shot,” we would murmur with a touch of irony that was completely lost on him as he raced away down the course after his ball. He made sure to arrive before of us, and his ball always achieved a suspiciously favourable lie, even in the thickest rough. “Will I make the green with a 6-iron?” he would ask innocently. “You might - eventually.” we conceded. Once on the green, he carefully paced out the distance and then lay flat on his stomach to read the green before taking the inevitable three or four putts. “Mark me down for a 6.” he would say. “What about all those hacked shots out of the rough” we reminded him. Off he went and we followed slowly in the forlorn hope that he might order a round of drinks, which of course he never did. We wish Harrington well in the Ryder Cup and hope he doesn’t encounter any of these problems at Whistling Straits. 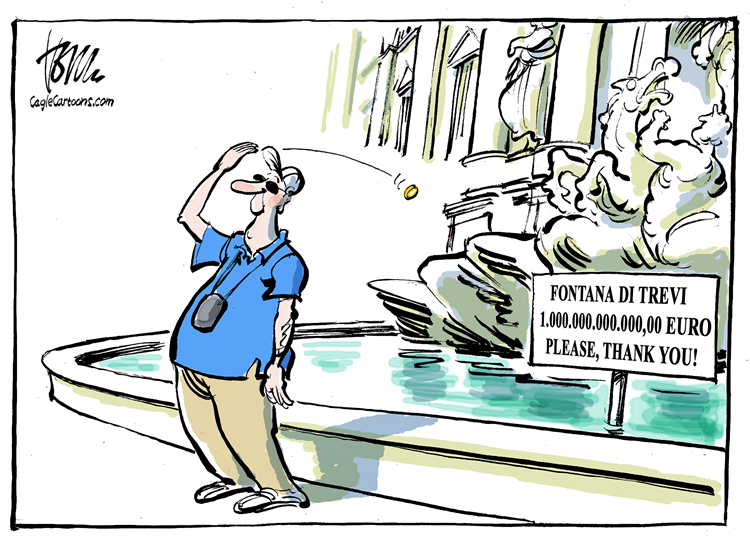 An unholy row between church and state has broken out in Rome over the coins thrown by tourists in to the Trevi Fountain. Traditionally, these coins were gathered up by the church and given to the Catholic charity, Caritas, to help the poor and homeless. However, when it was realized that the amount fished out of the water each day amounted to over €4000, then the local county council decided that the money belonged to them. Thus the unholy row. Of course, there is a precident for this in the bible. When Jesus was asked by the Pharisees if the people should pay taxes to Rome, he replied "Render therefore unto Caesar the things which are Caesar's; and unto God the things that are God's". It seems that whether you live on earth or in heaven, (or in Rome) there are taxes to be paid! DEATH: We offer sincere sympathy to the family of the late Mary Dan G. Harnett, Main St. whose funeral took place last week. May she rest in peace. CLASSES IN THE ADULT EDUCATION CENTRE (OLD TECH): The following are a small sample of the classes on offer in Mountmahon: Upcycling Furniture Tuesdays started last week, Computer Classes for beginners starting Tuesday, January 22, Abbeyfeale Wellness Monday January 28. Then in February it is hoped to run classes in Container Gardening, Up cycle your wardrobe, Healthy Meals in 10 minutes as well as an Introduction to the Hair and Beauty Industry, Wood Turning Level 3, Care Skills Level 5, Special Needs Assisting. Then in April classes will run in Child Health and Well Being and from Plot to Plate.